The Way of the Dragon. Smashed his previous box-office record. His first Actor/Director/Screenwriter 3-in-1 role debut. Stunning two-nunchakus wielding, long pole fighting, actual filmed side-kick-explosive scene, Gladiators-fighting in Rome Colosium, guest star from USA, etc. One of the best fight scenes from Bruce. Last but not least, Bruce demonstrated the respect with regret and sorrow of a worthy opponent. The fight scene with Chuck Norris showcased the world what possibly be the warrior’s spirit. The deceptive moves, the counter-measure tactics, and unbeatable spirit sum up the core story of this movie. Like part one, I intentionally NOT drawing Bruce in close resemblance, just only capturing his essence, all based on my memory. By the way, I watched this movie 7 times in cinema and 30 over times on VHS. The gladiators fight scene at Rome Colosium was classic. 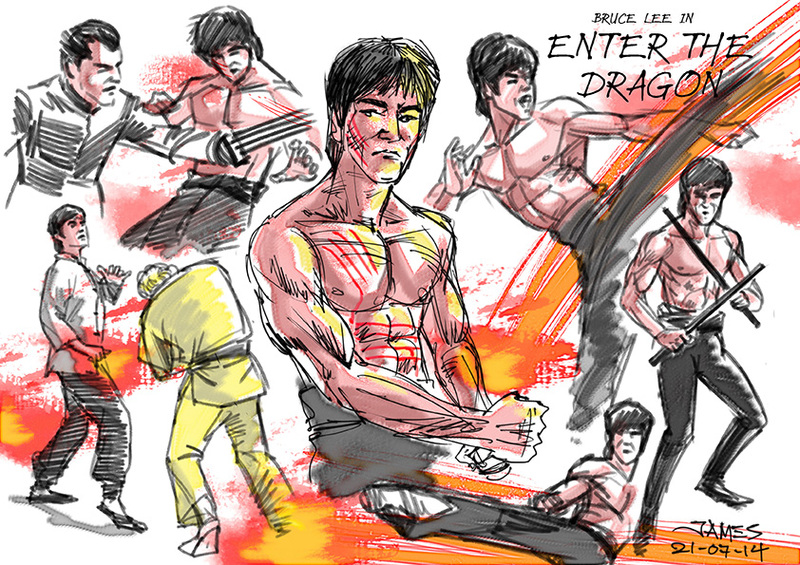 Then came this final movie, “Enter the Dragon” opened worldwide after his death. In the opening scene when he sparred with Samo Hung, I almost couldn’t recognise his thin but lean physiques. This was his first Hollywood debut. The fight sequence was badly shot. Especially the fight scene when Bruce was trapped in the underground production centre, so few wide shots, mostly tight cropped slo-mo. However brilliant the choreography from Bruce was totally messed up by the Hollywood idiots. The final fight scene with Shek Kin in the mirrored-room was too brief. Anyway, have to congratulate Bruce for showing the world what Kung Fu is all about. I honestly wished that he had finished “Game of Death” than wasting time on this movie. 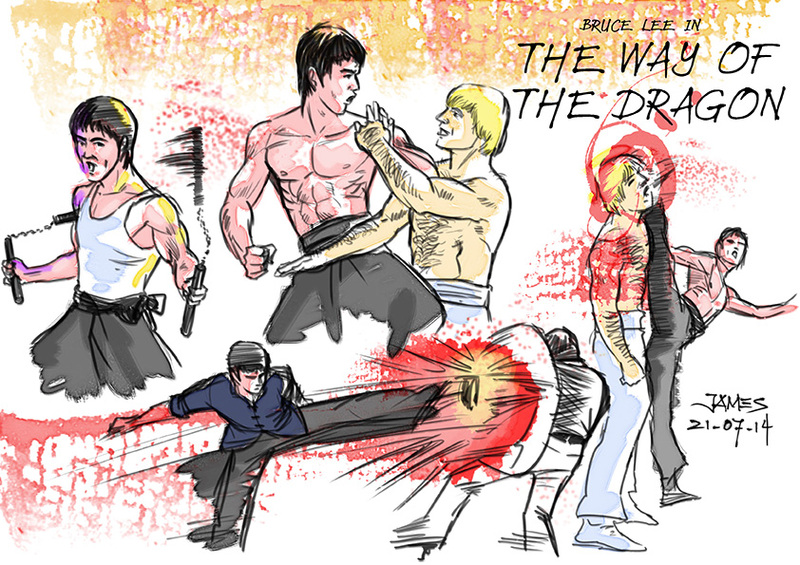 However, I will keep “Game of Death” sketch in another part because I simply love his concept of the movie and the introduction of a few interesting casts. The main Bruce sketch was done in an edgy way to demonstrate my shock on seeing his thin but lean physique.